Hi all - just a quick post to let you all know that I'm still around LOL.... I was feeling very proud of myself with my postings but now I've run out of cards to post.. Can you believe it!!! What is the world coming to? Have I not got my priorities straight? And the wording was embossed in gold, but it doesn't look very "embossed" does it??? Sorry - nothing I used is SU - please forgive me! I don't know about anyone else, but I am finding that now I use SU cardstock most of the time, when I use other cardstock for something I am very disappointed with the quality of the other cardstock. This is beautiful Deb. 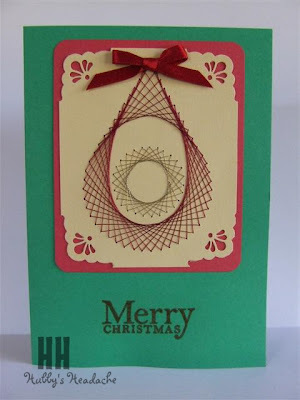 I love these stitched cards. For some reason, even though I love them so much, I can't get my head around them. Good on you. I love these cards Deb! I make these for my Hubby's bosses wives as they send them to Italy. I use beads on some and they turn out soooo pretty! If you want some more patterns let me know and I'll be more than happy to post them to you! BTW Great card, love the glitter thread!!! PS Sorry it was me who deleted the comment, full of bad spelling ROFLOL!! !